Tolstoy was another of the diplomat poets of the 19th century. He was encouraged to write by his mother & uncle (who was a writer) but he also pursued a career in the Foreign Ministry. He seems to have enjoyed the holidays more than the actual work & devoted his time to literature when he retired from the service at the age of 44 in 1861. He wrote plays as well as poetry & some of his work was later seen as prophetic as he warned against the autocratic ways of the Tsars. The Lord did not bestow at length. My wrath I spent on causes needless. In parrying, I faint away. And perish, wounded in the fray. Summer's Day is a school story with a difference. It's written for an adult audience rather than school age children & follows the teachers, staff & students of St Helens boarding school through one summer term. At the beginning of term, the staff & students prepare to return to school. Housemaid Alice tidies the Headmistress, Unity Bishop's, office; Miss Meadows, retired Classics mistress prepares to return to work to help out Miss Bishop who has lost another Classics teacher. Assistant Matron Honor Christow reluctantly prepares to leave her father's rectory to return to a job she loathes. Students & best friends Jasmine & Sophie prepare for one last fling at a grown up cocktail party before returning to the Upper Fifth. Young Margery clings to her Nannie & prepares for misery, comforted only by her stuffed toy, Augustus. Other staff begin the term with mixed feelings. The Cook, Mrs Prior, longs to see her sailor son, Jim, & lives for the times he has leave. She's a comforting presence in the kitchen & keeps an eye on the younger housemaids, Doris, Nora, Maude (known as Noranmaude) & pretty Shirley Briggs, who comes from a large, loving family that she visits on her days off. Mr Walker, the Art teacher, is an unhappy man. Forced to live with his miserable mother, he longs to be able to make a living with his painting but has to teach at St Helens instead. He's a bad teacher, with no real sympathy for his students & a hopeless passion for beautiful, aloof Jasmine. Albert Munnings, the gardener, lives with his wife & baby in a cottage in the grounds. Albert has been drifting since the War & exploits his Apollo-like beauty to flirt with Honor, Shirley & Poppy, the barmaid at the local pub. The narrative intertwines all these characters as we follow them through the term. Jasmine & Sophie spend as much time as possible subverting the rules & are more often to be found in Mrs Prior's kitchen eating cake & listening to stories about Jim's adventures or in their attic hideaway, than studying. They do each others homework & answer for each other at roll call. They hate sports & do everything possible to avoid it. Both girls are attractive but Jasmine is a beautiful girl, fully aware of the effect she has on Mr Walker, Albert & Sophie's cousin, Tom, home on leave from his Civil Service job in Africa. There's a core of steel in Jasmine & she is the despair of the Headmistress who can never accuse her of insolence, just complete indifference to school & all that it involves. Sophie is a gentler girl, spending hours playing with Albert's little boy, Geoffrey, although she fears she'll never marry "for already she despaired of finding Mr Knightley's equal." "Believe it or not, but one of the Sixth supposed to be watching the match was half-way round the pavilion and reading a book. And guess what it was?" From her expression Honor was about to hazard No Orchids for Miss Blandish but Celia said, "Poetry!" and taking a draught of tea she added profoundly, "Shelley" as if that made it worse. The structure of the book reminded me of Elizabeth Jane Howard's Cazalet novels, where we move from character to character, almost hovering above them listening to their thoughts before moving on. Small details tell so much about the people in this novel. The teacher who has a passion for detective fiction & keeps Jasmine waiting outside for her reprimand while she hides her latest mystery under the cushions; Miss Meadows returning to her dusty cottage for half-term & deciding to read in the sun rather than clean; Jasmine's lovely, cosy Aunt May (who has brought her up after her parents died) conspiring with Jasmine to avoid her boring clergyman husband; Mr Walker becoming known as Fishy after he unfortunately brings a lobster into class as part of a still life composition, "Before the lesson was half over he wished it at the bottom of the sea." The omniscient narrator does such a beautiful job of setting the scene, showing that the characters are all true to their natures, even in sleep. When the school was quiet the moon rose late and flooded the seaward rooms. It swept into the dormitory and turned Jasmine's yellow hair to silver, exposing with fine impartiality her sleeping features and Charity's button nose. It dropped on Matron's countenance, who pulled the sheet over her head. Honor dreamed that Albert was coming towards her over gold and silver flowers. Miss Bishop stepped firmly from her couch and drew down the blind. In Miss Meadows' room the moving flood lit up an open Theocritus upon a pair of cotton interlock combinations; in Alice's it received a welcoming grin from a tumbler containing her teeth. It fell upon the reverberating mound that was Doris and caught a gleam from Shirley's open eyes. There's a large cast of characters & it took me a while to work out who everyone was. I even started a list of who was who. Once I had a chance to read more than a few chapters at a time, I became caught up in the spell of the story & I loved it. I haven't even begun to mention all the characters & the subtle interweaving of their stories. It's a book that you have to set aside time to concentrate on but I think it's well worth it. I'm so glad that Scott from Furrowed Middlebrow raved about Summer's Day so much & made me feel that my life would not be complete until I'd read it! 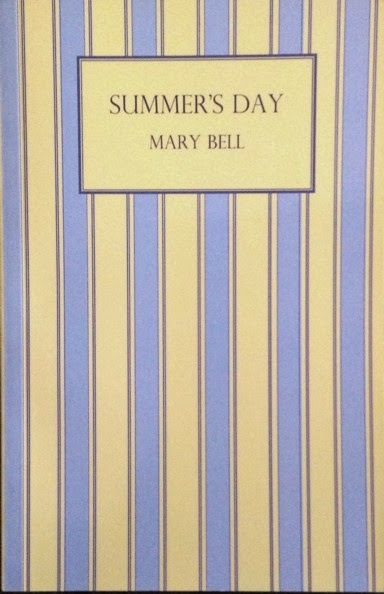 There are copies of Summer's Day available from Anglophile Books. 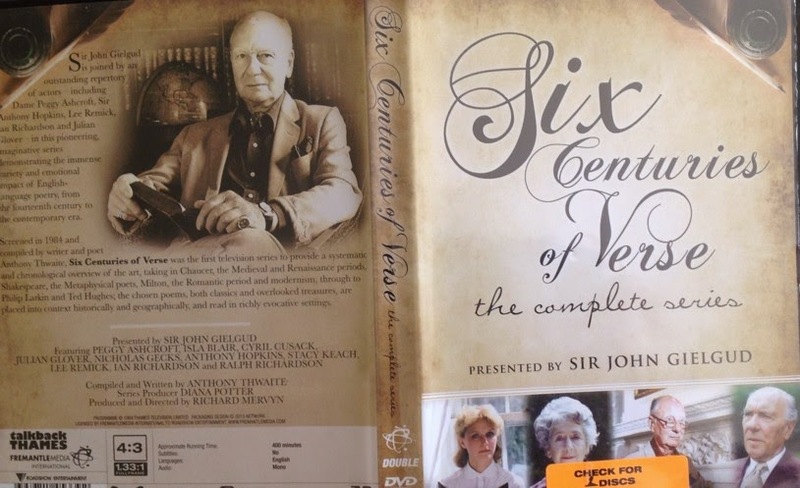 Thirty years ago I remember watching a wonderful TV series, Six Centuries of Verse. 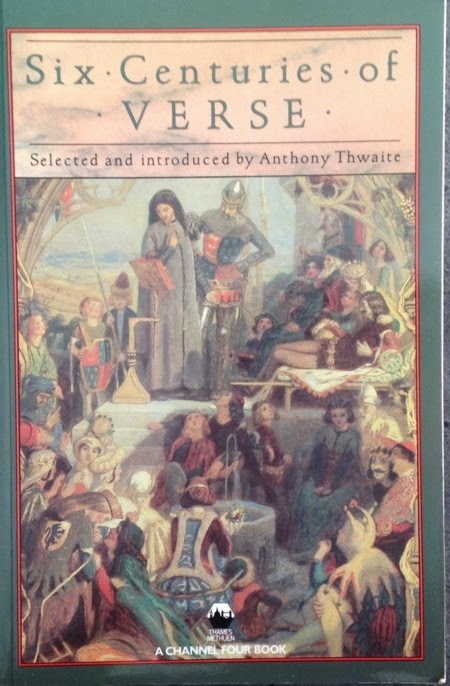 I loved it so much, I bought the book, written by Anthony Thwaites, who selected the poetry for the series which spanned English & American poetry from 1384-1984, Chaucer to Ted Hughes, over 16 episodes. The series was presented by Sir John Gielgud & featured actors reading the poetry. As well as the attraction of hearing some of my favourite poetry read by great actors, the series was filmed in beautiful locations - stately homes, gardens & churches. I was so pleased to discover that the series has been released on DVD at last. I've spent the last few weeks watching my favourite episodes again. Although it's a melancholy experience too, because so many of the great actors featured have since died. Gielgud, Dame Peggy Ashcroft, Sir Ralph Richardson, Ian Richardson, Lee Remick. Still, this is a beautiful series. Anyone who enjoys poetry would love it. It seems to be available on You Tube, but only in bits & pieces so the DVD is the best option. There is one clip on You Tube that I came across the other day which I think is just stunning. Christopher Eccleston reading Dulce et Decorum Est by Wilfred Owen. One of my favourite actors is Julian Glover. I remember him in By the Sword Divided, the Civil War drama series. Here he reads his own translation of Beowulf, as well as John Donne's The Flea & The Good-Morrow as well as a chilling reading of Browning's My Last Duchess. Peggy Ashcroft reads George Herbert & plays Cordelia to Gielgud's King Lear. Ian Richardson reads Blake's The Tyger & Christopher Smart's To His Cat Jeoffry, while sitting in a barn cuddling a cat. Lee Remick reads Emily Dickinson & Edgar Allan Poe. Six Centuries of Verse is a real treat for poetry fans. Finally, a poet who lived to a ripe old age! Tyutchev lived to be 70 &, as far as I know, never fought a duel. He was from a gentry family, politically conservative & had a very complicated romantic history. This poem may be part of the Denisieva Cycle, a group of poems he wrote about his relationship with a woman, Elena Denisieva, over twenty years his junior. The affair lasted fourteen years & caused considerable scandal at the time. She took them up and let them scatter. events beyond recall amassed there! Of love and grief, joy and disaster! Like some sweet spectral visitation. Bear them we can, and if we can we must. Shoulder the Sky is the third book in the Dering trilogy. I've read Vittoria Cottage, the first in the trilogy but not the next book, Music in the Hills. I'm a little hampered by what's available at Open Library & they have lots of incomplete series. 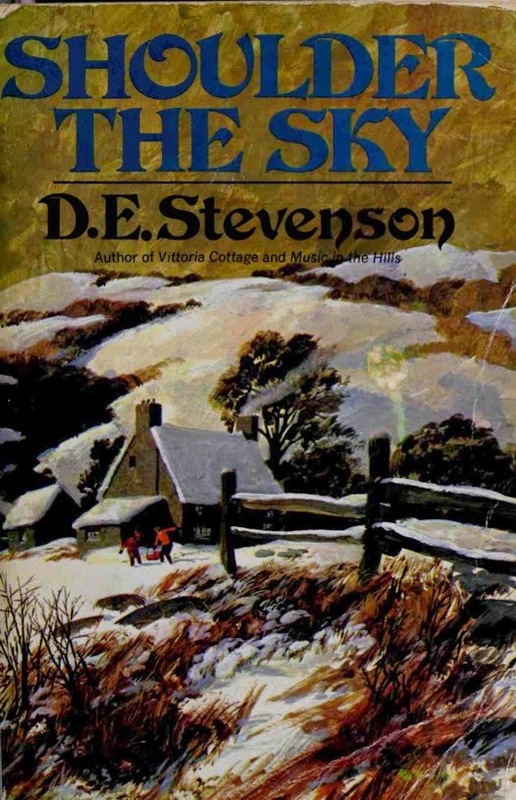 However, I've noticed that with D E Stevenson's novels, it doesn't matter as she manages to put you in the picture, & as I had very little doubt that James & Rhoda would marry, I was unsurprised to find them returning from their honeymoon at the beginning of this book. James has left the Army & decided to become a farmer, thanks to his uncle & aunt, Jock & Mamie Johnstone, who have made him their heir. Rhoda had a harder time deciding on marriage as she had the beginnings of a successful career as an artist in London & didn't see how she could combine marriage & her work. However, she has put aside her doubts & the young couple have moved to Boscath farm in Drumburly near the Scottish Borders. They have changed the family name to Dering Johnstone, in recognition of their new position & arrive in late autumn to set about putting their new home in order. Jock & Mamie have put the farm house in order, even employing a cook, Miss Flockhart, known as Flockie. She is one of Stevenson's loyal retainers, a treasure in every way. She meets her new employers in an unusual way when they arrive in the middle of the night without a key & James climbs through her bedroom window to get in. Rhoda finds the isolation of Boscath & her lack of occupation a problem at first, especially as James spends his days out on the hills learning about his livestock & employees. However, after avoiding the studio fitted out for her for some time, the day comes when Rhoda's inspiration returns & she takes up the brushes again. Her growing love for the area & her new neighbours helps as well as the discovery of a new pupil, Duggie, the son of Mamie's cook, Lizzie, who was evacuated to Murath from Glasgow during the war & never left. Duggie has real talent & his lessons with Rhoda give him a purpose that had been lacking in his life until that point. James & Rhoda soon get to know some of the neighbours, including Dr Adam Forrester & his sister, Nan. Adam has taken up a post as assistant to elderly Dr Black. He was recommended by one of the surgeons at his London hospital, a local man, Henry Ogylvie Smith. Nan had fallen in love with Henry & thought he loved her in return but his manner towards her changed abruptly & she thought she had imagined his love & felt foolish. Henry has a secret that prevents him proposing to Nan & they are both disconcerted when they meet again in Drumburly. Not all the neighbours are pleasant. The Heddles are incomers who have bought Tassieknowe, an old house whose owner has recently died, & transformed it into a monstrosity. Fitted carpets, turquoise paint on the walls, ultra modern furniture, everything that the old families of the district despise. Miss Heddle is an odd woman, prone to hearing noises & believing that the previous owner, old Mr Brown, is still flitting around the house, even though he's dead. 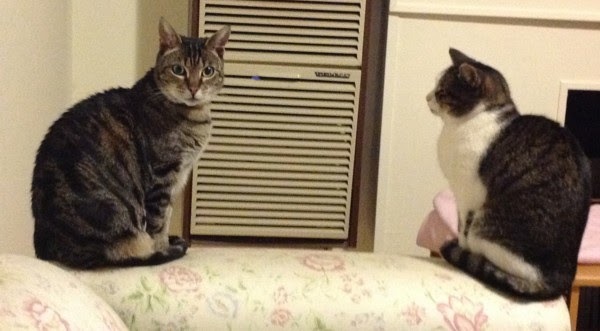 Her brother, Nestor, is selfish & arrogant. They have no idea how to farm the land, dismiss the shepherd who could tell them how to look after their stock properly & refuse to sell to Jock Johnstone who would look after the property in the right way. As the first winter of James & Rhoda's marriage passes, they suffer with their neighbours from the isolation & extremes of bad weather. They also become part of the community & grow to love their new life. This is such a lovely story. I love books set in Scotland & winter stories most of all so I was predisposed to enjoy this one. The portrait of James & Rhoda's marriage is very tenderly presented & I loved the fact that Rhoda got back to work rather than just dwindling into a wife. Jock & Mamie are real characters & the Forresters are a very sympathetic pair. There was one coincidence that I could see coming & just thought was a little too convenient but, apart from that, Shoulder the Sky is a delightful book that is full of Stevenson's love of Scotland. Adam expresses this love of home very aptly as he sits on a hillside with James. At the time of writing, there's a copy of Shoulder the Sky available at Anglophile Books. I borrowed More Writers & Company by Eleanor Wachtel, a book of essays & radio interviews from my library the other day, because it contained an interview with Carol Shields. 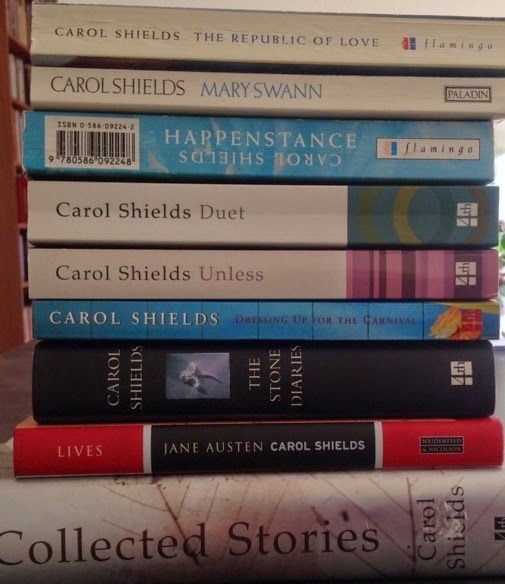 I love Carol Shields' writing, I've read all her novels & a lot of her short stories & the interview reminded me of the joy that I've had over the years from reading her books. I then realised that next year, 2015, would have been her 80th birthday. It may be a little early to be making plan for next year but, I've decided that in 2015, I will reread all her books in order, from her first novel, Small Ceremonies, to her last, Unless. I own most of the novels as you can see & I rescued a copy of the Collected Stories from a booksale a few years ago. 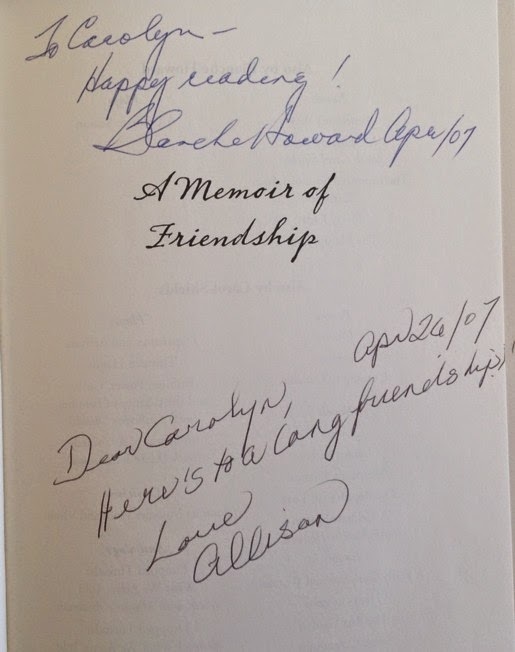 I've bought copies of Larry's Party & A Celibate Season, which I've read but didn't own, as well as Random Illuminations, a book of interviews with Shields by Eleanor Wachtel & a secondhand copy of A Memoir of Friendship : Letters between Carol Shields & Blanche Howard (the co-author of A Celibate Season). Imagine how pleased I was when my copy of A Memoir of Friendship arrived on Friday. Not only was it in pristine condition, it was signed by the editors. My reading tastes have been changing lately, or I should say, refining. 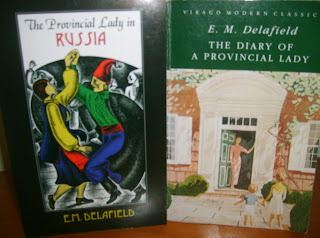 I've been reading a lot more early-mid 20th century fiction (D E Stevenson, Nevil Shute) as well as 19th century writers like Trollope & the books chosen for my 19th century bookgroup. I'm finding that I'm just not interested in a lot of the contemporary writers I used to read. I've reserved so many of their new books through habit but taken them back to the library unread because I wasn't in the mood. Maybe I'm also realising that I can't possibly read everything so it's probably best to concentrate on the books I really want to read rather than just the latest book in a series I've always read. In that novel (The Republic of Love) I was interested in what had happened to the whole idea of the love story, the great seizure of passion, the story we read from the nineteenth century. Something has happened to the love story; it's become a little bit flabby in our century. It's been done to death by pop-song lyrics, greeting card verse and the cynicism that's collected along the way. Nevertheless, I still think it's the thing that distinguishes a human life. I think it's what makes us larger than we are, it makes us better than we are. It's everlastingly mysterious. I love the themes & characters of her novels from Judith, the biographer in Small Ceremonies, to the multiple narrators, each with their own interest in a forgotten writer in Mary Swann, to my favourite of her novels, The Republic of Love, a glorious love story that takes in subjects from radio to mermaids. Some of her books (like these three) I've read several times. Others, I've only read once. Most of all, I love her humour. Her novels are wry & funny & poignant & I can't wait to read them again. 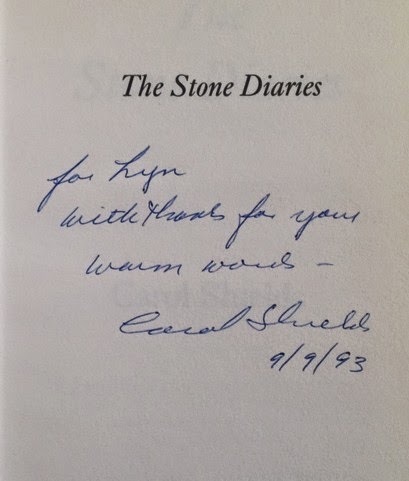 I was lucky enough to hear Carol Shields speak at the Melbourne Writers Festival in 1993. As you can see, she signed my copy of The Stone Diaries, which funnily enough, has always been my least favourite of her novels. It was the book that won the Pulitzer Prize, so I'm looking forward to reading it again & discover what I missed the first time, especially after reading this in the interview with Eleanor Wachtel in More Writers & Company. I have to tell you that, like most writers, I find writing hard work and what I love is having written rather than the actual writing. But I loved writing this book (The Stone Diaries). I never wrote anything with greater happiness. It seemed to me it was about something important and it seemed to be going well, and I gave myself permission to do just what you're mentioning, to have a little fun, and to recognize the fact that tghe novel form - my favourite form, my chosen form - is a lot roomier than I'd ever thought. In fact, you can put anything in it, you can stretch it in any direction you like, and more or less get away with it. It was also at that Festival talk that Shields spoke so movingly of the experience of reading Lucy Maud Montgomery's Journals which sent me off on another reading trail so it was an unforgettable day. Sue Hepworth, author of But I Told You Last Year That I Loved You, Plotting for Beginners & Plotting for Grown-Ups, blogged about Carol Shields just the other day. Have a look at her post here about the lovely postcard she received from Shields when she wrote her a fan letter. I don't have any strict plan for the year. I'll post a list of titles at the beginning of the year if anyone would like to read along & the books will appear On My Reading Table (on the right >>>) as I'm reading them if anyone wants to read along. I think it will be fun & I'm looking forward to reading more about Carol Shields as well as reading her books again. 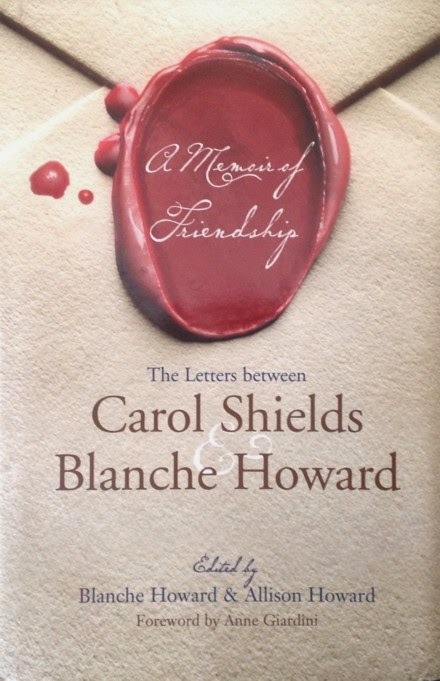 There's more information about Carol Shields at the website of the Carol Shields Literary Trust. Another poem by Lermontov this week. This one is gently elegiac but also sadly ironic as it was written in the year of his death. He was killed in a duel with a fellow officer at the age of 26. I walk out alone into the darkness. Star with star holds converse in the night. Old regrets? Or expectation's birth? Bend their boughs and rustle close above. 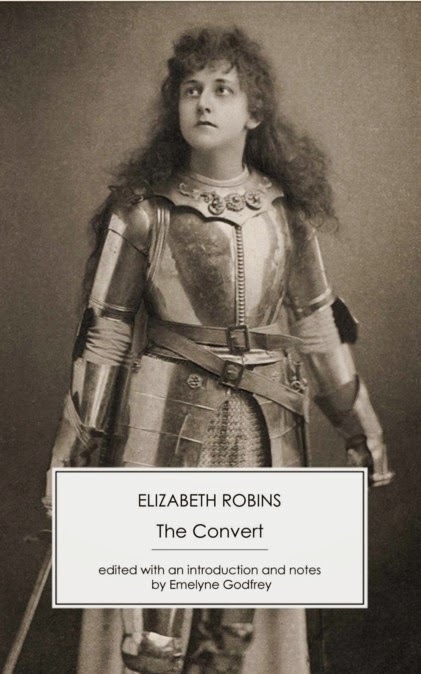 After reading Kate Parry Frye's suffrage diary, I was keen to read The Convert, a novel about the suffrage movement adapted from her own play, Votes for Women, by Elizabeth Robins. Vida Levering is an attractive woman in her early 30s who lives with her half-sister, Janet Fox-Moore, a flustered, timid woman married to an exasperated, overbearing husband. Vida's upper middle-class social circle can't understand why she hasn't married but Vida isn't interested in any of the men on offer & keeps her own counsel. In Edwardian England, the issue of women's suffrage is becoming more prominent & one day, after hearing one of the men at a social gathering pouring scorn upon the suffragettes & calling them "sexless monstrosities", she suddenly reacts against the prevailing opinion, "I've sat and listened to conversations like the one at tea for a week now, and I've said as much against those women as anybody. Only to-day, somehow, when I heard that boy - yes, I was conscious I didn't like it." Vida goes along to several open-air meetings & listens to the speakers, becoming particularly interested in Ernestine Blunt, who can hold her own against the hecklers that make up the majority of the audience. Young, intelligent & very self-possessed, Ernestine & the other women impress Vida & she becomes converted to the cause. To the alarm & amusement of her friends, she becomes involved in a charity to provide shelter for homeless women (there's already a similar scheme for homeless men but women aren't admitted) & eventually takes her place on the platform as a speaker herself. Geoffrey Stoner, one of the most influential & self-satisfied men in Parliament, is also on the fringes of Vida's circle although she does her best to avoid him. Stoner has recently become engaged to Jean Dunbarton, a young, idealistic girl, who becomes interested in the suffragettes & this leads to the explosive final chapters of the book. 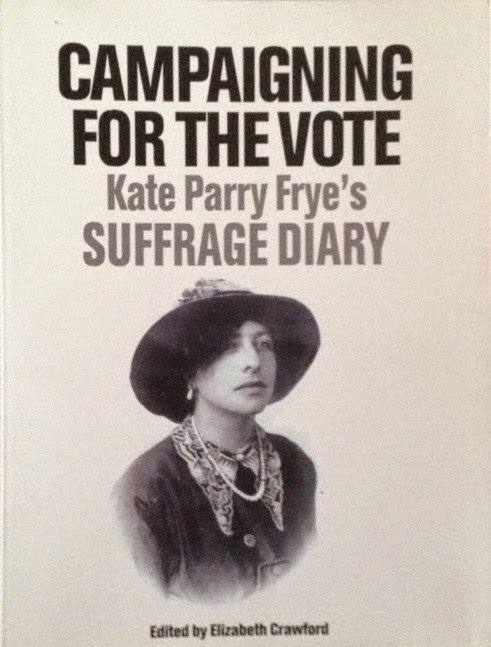 Reading The Convert just after Kate Parry Frye's diary was fascinating as it showed the struggle that Kate & women like her went through in getting the message of women's suffrage through to the ordinary man & woman in the street. It also emphasizes the perfidy of the politicians, mostly Liberal, who promised support when they needed the women in their election campaigns but then reneged once they were elected. Seeing the struggle through the medium of Vida's awakening consciousness is very effective & the open air meetings seem to be virtually verbatim reconstructions of the real thing. As a novel, The Convert isn't perfect. The action sags in the middle as we get bogged down in the interminable meetings in Hyde Park where the speeches are given in full & every heckler & interjection is recorded. Apparently in the play that was the basis of the novel, these scenes were the highlight of the performance as the actors interacted with both the actors playing the hecklers & the audience as well. In Angela V John's biography of Robins, she details the extensive research carried out for the play & the novel. The speeches & the heckling were based on reality & this does come through very strongly. I just felt that it went on too long & slowed down the plot. The final third of the book is terrific & I read it in one sitting. I don't want to say more about the more personal aspects of the plot involving Vida's past as the revelation is devastating to several characters & it deserves to be a surprise to the reader as well. If you're at all interested in the suffrage movement, The Convert is a compelling story & certainly worth reading as a document of the times by a woman who was a witness. Among her many other talents, Robins was an actress & one of the founders of the Actresses' Franchise League that Kate Parry Frye joined. The Convert is the first title in the new imprint, Twentieth Century Vox, which is part of one of my favourite small publishers, Victorian Secrets. I've already bought the second title, The Good Comrade, by Una L Silberrad, edited by Kate Macdonald. I'm looking forward to reading it as a book about the theft of a rare blue daffodil has to be fascinating. Kate has podcasted about two other Silberrad novels, The Honest Man & Keren of Lowbole at her website, Why I Really Like This Book. This is a very quiet, elegiac book that tells an epic story. In 1851, Jean Marie Latour is appointed Apostolic Vicar to the new American state of New Mexico. Latour sets off for his new home & experiences many hardships. He must bring together the European, Mexican & Native American people of the diocese with very little help or guidance. He experiences great hardships, travelling long distances through hostile territory & has to impose his authority on recalcitrant priests. He hears stories of the past & struggles to make sense of the place of the Church in the lives of his most impoverished parishioners. Forty years later, as Latour, now Archbishop, reaches the end of his life, he spends his retirement gardening & training new missionary priests from France in the ways of his parish. Born in France, Latour has been a parish priest near Lake Ontario since he left the seminary & went to the United States as a missionary, with his great friend, Father Joseph Vaillant. Latour is sent to New Mexico to take charge of a vast diocese that has had no real discipline imposed on it for some time. The original Spanish missionaries who went out to New Mexico were driven out in the early 18th century & the current Bishop of Durango simply ignores the directives sent by his superiors in Rome. Latour & Vaillant reach Santa Fe to discover that no one knows who they are & no one pays them any attention. The documents sent to announce his appointment are at the mercy of a non-existent postal service so Latour decides to go to Old Mexico to visit the Bishop in person. On this first journey in his new home, Latour becomes lost & is lucky to stumble across a Mexican settlement where he is welcomed & his arrival is seen as the answer to prayer as the villagers have been without the services of a priest for some time. There are marriages to be performed & children to baptize. This first experience shows Father Latour where his efforts must be directed. He sees his deliverance from almost certain death as a sign that he has made the right decision in coming to New Mexico. Wherever he went, he soon made friends that took the place of country and family. But Jean, who was at ease in any society and always the flower of courtesy, could not form new ties. It had always been so. He was like that even as a boy; gracious to everyone, but known to very few. There are some wonderful stories in the novel. Father Vaillant is short & has trouble riding a horse comfortably. He convinces a wealthy parishioner to give him not one but two mules - one for himself & one for Father Latour. Father Vaillant could not be happy with a comfort that his friend could not share & the mules had been brought up together & so would be miserable apart. It's done with such humour & humility that the parishioner, who was happy to give one mule, decides that he's just as happy to give both his prize animals. Father Vaillant later goes to the goldfields of Colorado to minister to the miners & bring some religious comfort to a lawless place. He has a wagon constructed especially to carry all the things he will need to save souls & spread the Gospel & he & his wagon soon become famous throughout the territory. He would return to New Mexico on what he called begging expeditions but never returned for good. Another time, the two priests are travelling in unfamiliar territory when they stop to ask shelter from a man whom they instantly dislike. His frightened, downtrodden Mexican wife, at great risk to herself, warns them to leave immediately &, acting on their own instincts, they do so. The woman, Magdalena, escapes in fear of her life & follows the priests back to Santa Fe. She tells them of her husband's cruelty & that he had murdered four travellers & had planned to murder the priests as well. The journeys taken by the priests show them the vastness of the territory. I loved the descriptions of the wilderness & the landscape. Father Latour is a very self-contained man but he responds to the beauty of the landscape. He respects all his parishioners & treats them all with love & compassion. He is strict in his expectations of his priests, however, & his standards of behaviour are met eventually by the many renegade priests who had exploited the laxity of the previous Bishop's rule. As I said at the beginning, this is an elegiac book. That may seem odd when there is so much action, so much danger & peril. However, there's a serenity in Willa Cather's writing that I find so attractive. Father Vaillant often said that he had wished for a life of contemplation before he agreed to go out as a missionary but realised that God had other, better plans for him. The strength of the two men's belief & conviction is at the core of the story & it's their confidence that they are on the right path, no matter how difficult or perilous their situation, that is so admirable. They are humble, very attractive personalities & I loved reading about their lives & about a part of the world I knew nothing about. 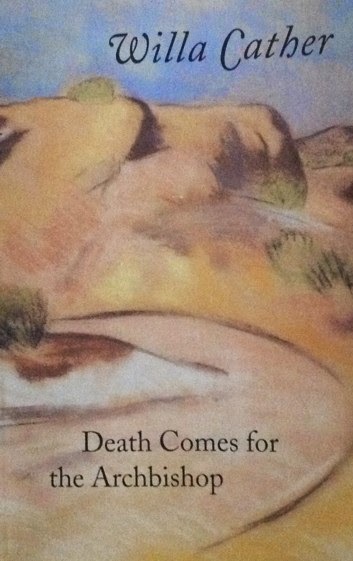 Death Comes for the Archbishop is a beautiful book & I'm looking forward to reading more Willa Cather very soon. 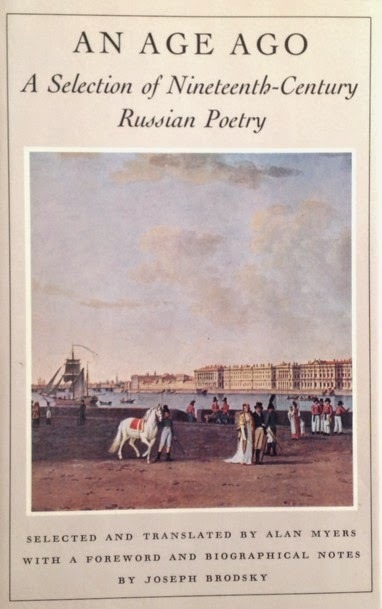 Apart from Pushkin, Lermontov is probably the best known poet in this anthology. His novel, A Hero Of Our Time, is still in print. I have vague memories of reading it a very long time ago. His poetry was also influrntial. Tolstoy apparently said that Lermontov's poem, Borodino, gave him the inspiration for War and Peace. Lermontov was another military man from an impoverished noble family, as so many of the Russian poets of the Romantic period were. He was outspoken in his belief that Pushkin's death in a duel was covert assassination. When his poem on the subject came to the attention of the Court, he was sent into exile. Lermontov was also killed in a duel, at the age of only 26. I'm reading Jack London's The Sea-Wolf with my 19th century book group at the moment & so I'm drawn to this poem, The Sail, just because of the seagoing theme. What quest has driven him to wander? Why has he left his native bays? Nor is it happiness he flees! As if in storms to find repose! Thank you very much to Pam at Travellin' Penguin for nominating me for this award. I don't usually participate in memes & merry go rounds but I enjoy Pam's blog (especially her trips around Tasmania searching for vintage Penguins) so here goes. Thank and link to the person who nominated you. 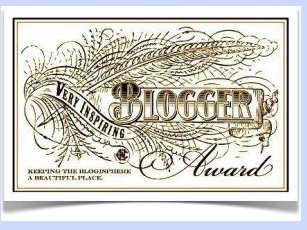 Optional: display the award logo on your blog and follow the blogger who nominated you. Well, here are the seven facts about myself. 1. I've been a librarian for 25 years. 3. I have almost 1000 unread books on my shelves (I confessed to that just the other day but I have to say I'm closer to the magic 1000 now than I was then). 4. I can't swim (can't see very far without glasses) & have never ridden a bike, probably because I'm very clumsy & would be sure to fall off. 5. I've become an enthusiastic veggie gardener over the last few years. 6. I've read Jane Eyre, Wuthering Heights & Persuasion at least a dozen times each. 7. I've amazed many people at work by becoming part of the ELearning Team, embracing new technology & proving that I'm more than a 19th century woman in a 21st century world (something a friend often says about me). If any of those bloggers see this post & wish to join in, that would be great. Kate Parry Frye worked as an organiser for the New Constitutional Society for Women's Suffrage (NCS). In 1911, when the diary begins, Kate was 33 years old. She came from a family whose fortunes had declined. Her father, Frederick, was the owner of a chain of grocery stores & a Liberal MP in the 1890s. Kate's mother, Jane, was connected by marriage to the famous Gilbey family of wine & spirits fame. This connection was useful for Mr Frye's grocery business but, unfortunately, by 1911, the business had all but failed. The family gradually retreated to their home at Bourne End, called The Plat. Eventually they had to rent The Plat out & lived in rented houses until, by 1913, they were forced to sell. Kate had grown up in a secure middle-class family. She had little formal education, but loved the theatre & took lessons in singing, dancing & recitation. She became an actress & had some limited success, touring in a production of J M Barrie's Quality Street. It was on this tour in 1903 that she met John Collins, & they became engaged. Kate often seems rather lukewarm about John, who was very much in love with Kate although she doesn't seem to care for him nearly as much. Certainly in the diary, she mentions her infatuation with at least one other man. John was a fairly unsuccessful actor & they had a long engagement as they couldn't afford to marry. Kate's family supported her theatrical ambitions &, later, her interest in suffragism. She began as a volunteer for the NCS but was glad to accept a paid position as an organiser in 1913 as the family fortunes declined. The NCS was one of several organisations dedicated to extending the franchise to women. The most famous was the Women's Social & Political Union (WSPU) founded by the Pankhursts & notorious for their militancy. As the name suggests, the NCS wanted a constitutional solution to the problem & worked on spreading the word & trying to influence politicians to introduce a Parliamentary Bill for women's suffrage. They also canvassed against anti-suffrage politicians. Kate first became interested in suffrage through attending meetings of the Actresses' Franchise League in 1909, the year before the NCS was founded. Kate's job was to travel around England, mostly Kent, Norfolk & Essex, organising meetings, gathering speakers & canvassing for women's suffrage. I am clean off this campaign. Then home to my pic-nic existence with a mood on me one could have cut off in chunks. I suppose it's a mixture of fatigue and homesickness and disappointment. If the work would only go well I would not mind and it would help me put up with my lot. Why must I live in horrid rooms amongst other people's hideous possessions. What am I paying for, shall I ever have done paying - if only something would come out of it, if only I could justify my existence somehow!!!! As well as the day to day work of an organiser, Kate took part in some of the great set pieces of the suffrage movement. She marched in the Women's Coronation Procession organised by the WSPU as a demonstration of women's solidarity. It was the biggest such demonstration ever held & was timed for a few days before the coronation of George V. Kate marched with the Actresses' Franchise League & had a wonderful day, culminating in a meeting at the Royal Albert Hall addressed by Mrs Pankhurst. She was a Group Captain & very proud of the honour. I was the 3rd section behind the third Floral Arch - very pretty it all looked but some of the walkers of the AFL looked very dowdy. But it was all simply magnificent - 70,000 of us, five abreast, and some of the Sections were just wonderful - a real pageant and I enjoyed myself tremendously. ... The end had not left the Embankment before we started the meeting at 8.30 - 7 miles, 1,000 banners 70 bands. We were just behind one and it was quite lovely marching to it. We kept time to it and at least walked well. Several of the onlookers I heard say that ours was the Smartest Section. Kate also witnessed the funeral procession for Emily Wilding Davison, who was killed when she ran in front of the King's horse at Epsom on Derby Day 1913. We saw it splendidly at the start until we were driven away from our position and then could not see for the crowds and then we walked right down Buckingham Palace Rd and joined in the procession at the end. It was really most wonderful - the really organised part - groups of women in black with white lilies - in white and in purple - and lots of clergymen and special sort of pall bearers each side of the coffin. She gave her life publicly to make known to the public the demand of Votes for Women - it was only fitting she should be honoured publicly by the comrades. John Collins had joined the Territorial Army & was in the Essex and Suffolk Royal Garrison Artillery & so was mobilised with his unit on the outbreak of WWI. He & Kate were married on her 37th birthday in January 1915. She resigned from the NCS in 1916 & the remaining diary entries in the book are on suffrage matters - the granting of the franchise in 1918, the first time she voted in 1924 & attending Mrs Pankhurst's funeral in 1928. Elizabeth Crawford made the decision to edit the diary severely to only include information about Kate's suffrage activities. While I can understand that the book needed a focus, I would have liked a bit more about Kate's personal life outside the movement. Crawford writes linking passages between entries when Kate is on holidays or visiting family but restricts the entries to Kate's activities as an organiser. Elizabeth Crawford's blog, Woman and her Sphere, is a great resource for information about the suffrage movement. There are links to all the entries she has written about Kate & other suffrage stories as well. Kate (played by Romola Garai) is going to be featured in the ITV series, The Great War, the People's Story. 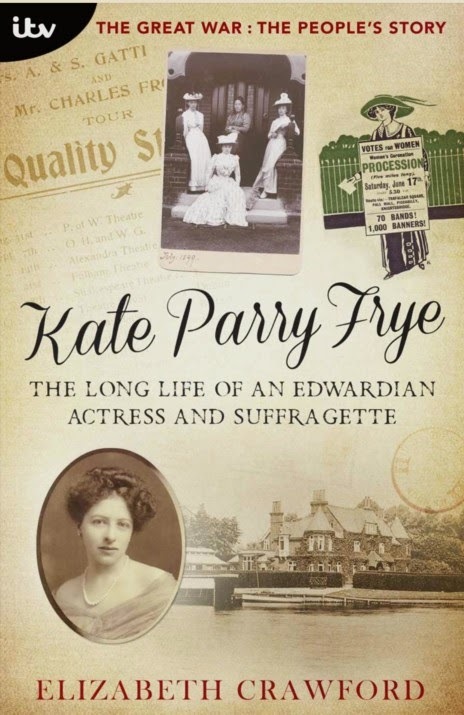 Elizabeth Crawford has also written a biography of Kate to be published as an ebook in early August (today, in fact), Kate Parry Frye – The Long Life of an Edwardian Actress and Suffragette, which I'm looking forward to reading to find out what happened to Kate after the struggle for women's suffrage was over. Edited to add : and here it is, just downloaded this very minute! The Four Feathers is one of the most famous adventure stories of all time, although probably through the many movie adaptations rather than the original book. The story of Harry Feversham, who is handed white feathers for cowardice by three friends & his fiancée, & his quest to make them take back their feathers, is well-known. I was surprised to find that, for me, Harry wasn't the hero of this story at all. Harry Feversham has grown up in a military family. The portraits of his ancestors look down upon him at Broad Place & his father fought in the Crimean War. Every year, on the anniversary of a great battle in the Crimea (& also Harry's birthday), a group of old soldiers get together at Broad Place to tell stories & remember their fallen comrades. On one occasion, when Harry is home from school, he joins the men & hears stories of great bravery & also great cowardice. Harry is a sensitive boy, who takes after his dead mother, Muriel, rather than his stolid, unimaginative father. As he goes to bed on that night, he looks at the portraits of his ancestors & believes that he is destined to be a coward rather than a hero. Only one of his father's friends, Lieutenant Sutch, sees what the boy is feeling & offers to help him if help is ever needed. Years later, Harry has joined the Army & is engaged to a beautiful Irish girl, Ethne Eustace. At dinner with friends in London, he talks of resigning his commission & living with Ethne in Ireland. She loves her home in Donegal & will never leave it. A telegram arrives for Harry telling him that his regiment is about to be deployed on active service in the Sudan. He burns the telegram without telling his friends of the contents. One of the men, Captain Trench, has glimpsed his own name on the telegram as it burned & determines to find out what was in the telegram. He & Lieutenant Willoughby visit a mutual friend, Castleton, who had sent the telegram, discover the contents of the message & realise that Feversham had sent in his commission on the very same night, as if he hadn't known about the deployment. The fourth man at the dinner, Lieutenant Jack Durrance, is unaware of all this as he can only focus on the fact that Harry is engaged to Ethne, the woman he loves. At a grand ball at Ethne's home in Ireland, Lennon House, all seems set fair for Harry & Ethne's future. A box is delivered to Harry in the middle of the ball. He opens it in Ethne's presence & three white feathers flutter to the ground. Ethne asks the meaning of the curious gift & Harry tells her the truth, that he resigned his commission even though he knew that his regiment was destined for war. Ethne is shocked & her proud nature won't allow her to marry a man she can't respect. She takes a white feather from her fan & adds it to the three feathers from Castleton, Willoughby & Trench. The engagement broken, Harry leaves next day to tell his father what he has done & he effectively disappears. Harry eventually decides that he must force all four to take back their feathers. He goes to Egypt & the Sudan in disguise & lays his plans to prove his bravery & remove the stain of cowardice. Meanwhile, Ethne has never stopped loving Harry. She burns all his gifts & letters but keeps his photograph by her always. Jack Durrance doesn't know of the feathers & has no idea why the engagement has been broken off. He continues his friendship with Ethne, hoping that one day she will turn to him. On active service in Africa, Durrance is blinded & Ethne decides to marry him. Staying with a friend, Mrs Adair, who is herself in love with Durrance, Ethne receives a visit from Willoughby, who brings her his feather & tells the story of Harry's bravery. Ethne is torn between her love for Harry & her determination, as she says, to not ruin two men's lives. She says nothing to Durrance but his perception is keen & he will not stop until he has discovered the secret of Harry's disappearance. The Four Feathers is the kind of book that could only have been written before WWI. The story is full of a very Victorian notion of bravery & honour that the characters believe in absolutely. Harry is the most influenced by it & the fact that he endures great hardship & pain during the years of his quest barely redeem him in his own eyes. All he cares about is that his reputation is restored in the eyes of the others, especially Ethne, as he asks that the men return the feathers to her. He feels that his life is effectively over. He assumes that Ethne doesn't love him & will marry someone else but he wants her to know about his deeds so that they may meet as friends in the afterlife. I found Ethne a difficult character to sympathise with. She is just as rigid in her notions of right & wrong as old General Feversham, Harry's father. Her determination to marry Durrance although she doesn't love him, is misguided & she is very cruel to him in one scene where she walks away from him as he is talking, knowing that he's blind & thinks she's still there. To me, Jack Durrance was the real hero of the book. He gradually discovers Harry's story &, because he believes that Ethne has ceased to love Harry, asks her to marry him. When he's blinded, he offers to release her from their engagement & eventually believes that she loves him, mistaking her changed attitude to a growing love for himself rather than her delight at hearing of Harry's redemption. His unselfishness in helping Harry & Trench escape from the horrific prison at Omdurman & releasing Ethne from her promise made him more heroic to me than Harry's quest. Harry is no coward. He could have gone on active service & would probably have acquitted himself well. 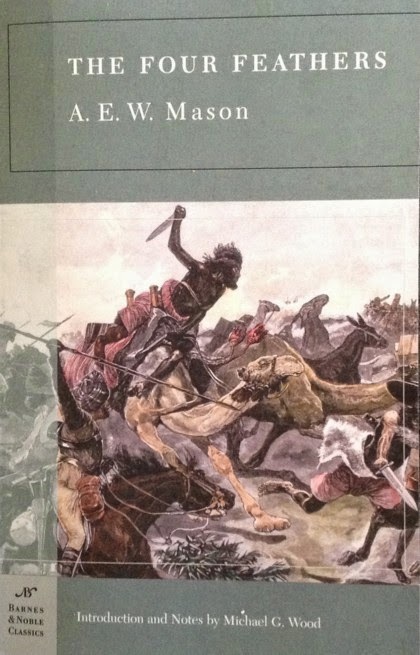 I suppose it reflects the different attitudes to heroism that we have now, over 100 years after the book was published. And, of course, if the telegram had come the day after Harry has resigned his commission, his honour would have been intact but there would have been no book! The Four Feathers is a great read & a portrayal of a way of life & of attitudes that have disappeared. 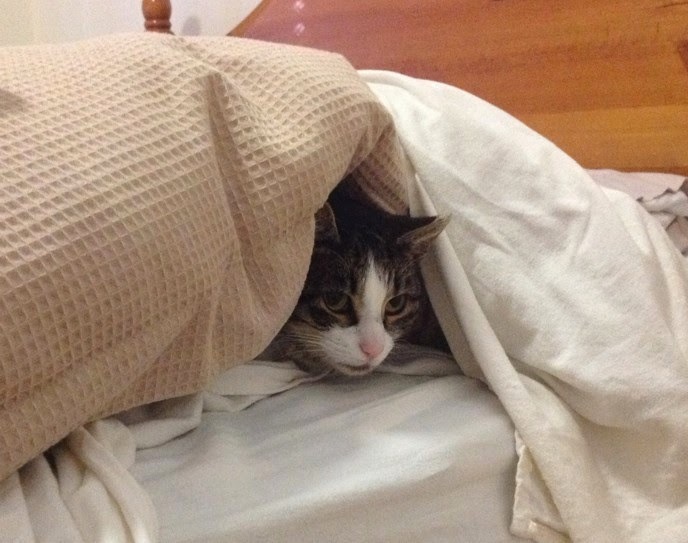 Lucky & Phoebe have very definite ideas about their favourite cosy places. Lucky loves to sleep under her blanket (really my old dressing gown) & I've never seen Phoebe anywhere near this much-loved but battered piece of cloth before. So, I was amazed to see Phoebe settle down on the edge of the blanket the other night. I was even more amazed when Lucky scrambled underneath & went to sleep anyway. The next day, Lucky had obviously decided that she would show Phoebe that no cosy spot was out of bounds & climbed up on the top of the new chair I bought a few months ago. 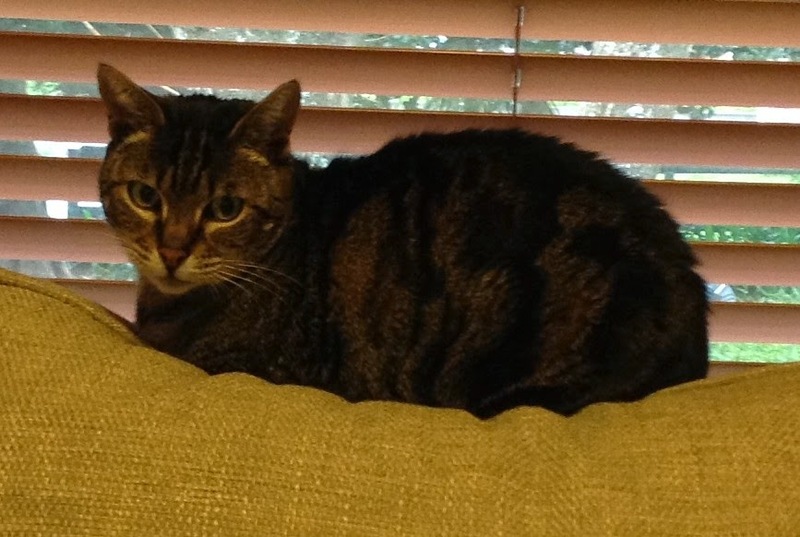 This has been Phoebe's spot since the day it arrived but Lucky had decided that all's fair in love & war. She looked very comfortable, too. Yazykov was born into a gentry family & seems to have spent his youth enjoying himself so much that he spent long periods in later life travelling for the sake of his health. He was known as a writer of poetry & drinking songs & was very popular among his fellow students. He became more conservative as he grew older, but this poem, written when he was 20, reflects his more liberal youth. My purse and you are so soon parted. My finances - very small! It can't be done, no use repining! And no post-horses to be had. Now glinting as the tears start flowing.